I am struggling to believe it's already July. That's more than half way through the year! Why is time flying so quickly this year. I feel like everything is coming and going so fast. My birthday has past, Paris has gone, exam results are already back. Don't get me wrong it has been a great year so far and a lot of great things have happened, but it's all passing me by. It will soon be September and before I know it I'll be back at Uni taking my last year, maybe ever, of academic classes. Which I really don't know how to feel about it. I knew it was going to be a big year, I just didn't realise how fast it would all go. Anyways, before I get carried away with wishing the rest of the year goodbye here are my goals for July. +Getting research done for my Dissertation. +Remaining positive and positive with my outlook (maybe doing activities to help this). +Writing more Prose in general, practising ready for September. +Start reading more (I have just started reading Bridget Jones' diary that was delivered on Saturday morning and I am already loving it! A little different, well a lot different to my last read 'The Help', but I already know I am going to love it. Although, I have watched the films so already know how it goes). +Establish a good eating schedule. +Keeping a better, more detailed diary of what I eat to see if there are any triggers for my problems. +Eat as healthy and clean as possible. +Watch portion sizes/ Weigh certain foods (to prevent going over board). +Aim to complete some form of exercise each day (could be yoga, could be running a mile on the treadmill). +Keep it up, don't slack - it's all about getting into a routine. +Push past my comfort zone. 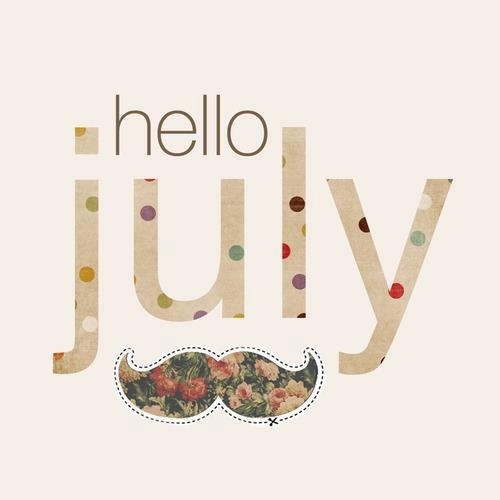 In general I just want to make July a month of well-being, and make it all about looking after me and making sure I am doing good. I am a big believer in if you are not doing good then how can you expect yourself to help others. So, it's going to be about stripping back for me and trying to reclaim what I've had that has been successful for me in the past. But not just using that, bringing it forward and building on it for the here and now. Taking away the struggles or niggles that I've had the previous month and re-painting my blank canvas, so that I become stronger again.